A 163yr old privately held 7th generation 19th & 20th Century industrial “brown box” packaging company transforms itself into a 21st Century Consumer and Design focused company by innovating the role of management, the business model, and emphasizing their culture and values through the creation, communication and execution of a new strategy. The results were game-changing solutions for customers, passionate employees, market and financial leadership and a cool place to work. Menasha Packaging Company (MPC) of Neenah, WI is the original and largest business of $1 Billion 163 year old, Menasha Corporation. We had a history of success and a culture of entrepreneurship, collaboration, autonomy and trust and faith in each other. Back in the early 1990’s, Jerry Hessel, one of our General Managers, believed team-based manufacturing improved performance and asked Jeff Krepline, Training Coordinator, to help improve the “Management-Union” relationship in his plant. Through Jeff’s program, including a steering committee of management and union reps, innovations arose from the plant floor, collaboration increased and trust developed. Success was coming to an end. In 2003, we were not doing well. We were a niche player in the “brown box” corrugated commodity market without the economies of scale and scope to compete with the big integrated firms. We made some specialty and display packaging, but the core was “Brown” and the numbers were going red. We were struggling to compete in a consolidating industry with increased regulation and with customers moving their manufacturing offshore. Our historical culture had significantly suffered from these pressures. When it was announced that we were up for sale, the uncertainty and fear of our then approximately 2000 employees further compounded the weakening culture. We were a relatively new leadership team with little time to turn the business around. We decided to create a bold, living strategic plan that included deliberate cultural revitalization. Our strategy invested in 1) our people; 2) our business model; and 3) our processes and equipment to deliver the first two. We believed executing this strategy would create significant growth that would also create the credibility and evidence to revitalize our culture. Today, our 1900 employees design and manufacture specialized packaging, merchandising solutions and provide consumer shopping/purchase/retailer insights for category leading Consumer Product Goods (CPG) companies. And oh, we still do “brown” but it’s in the black now. In 2004, Jeff started experimenting with an innovative way to go to market (RII – Retail Integration Institute). This changed how we viewed our customers’ retail challenges and their customers’ buying decisions. We used that merchandising insight to highlight our unique customer benefits. Mike Waite, recently promoted to President, gave ‘air cover’ to protect RII from skeptics while it gained acceptance with customers. The encouraging financial and cultural results gave us hope as we embarked on a new strategic planning process with Deb in 2005. We believed culture was key to success. Our strategic hypothesis? Turning the company around meant we wouldn’t be sold; not being sold and being successful would restore trust and faith, renew autonomy and entrepreneurship resulting in more success, which would further strengthen the culture – a virtuous cycle. The strategy focused on our people, products and processes with aggressive top and bottom line goals based on a non-traditional new business model. The “AND/BOTH” (not “Either/Or”) strategy let us achieve customer AND employee-advantage with increased customer value AND decreased costs (not price). In Deb’s opinion, a large key to our success was, and is, Mike’s willingness to make himself vulnerable, which, as John Hagel rightly says, is needed for trust. He admits when he doesn’t know or understand which frees others to learn and share. Mike is the epitome of a servant leader. As an in-law to the founding family (Mike Waite is married to a 5th generation daughter), he sees himself as a steward of MPC for employees, customers, shareholders and the community. The new strategy drove significant product, service and process innovations (see attached “Helpful Materials: Documents: MPC Strategy and Innovation Timeline.pdf”) by increasing employee autonomy, self-management and self-organization. Our plants were already entrepreneurial and we (headquarters – HQ) were fairly hands-off, but the scale and scope of autonomy needed to grow to achieve our strategic goals. By freeing our people to innovate, they did just that. Unlike other companies with formal processes and procedures for self-managed and organized teams, our approach is informal, emergent, and maybe even ‘’genetic.” We felt creating policies and procedures for how teams are chosen, organized, led, or resources allocated ran counter to employee autonomy and entrepreneurship. This is not to say process isn’t important, it is; however we wanted to emphasize outcome not dictate a prescribed process. So, as people at any level see an opportunity or challenge or get an idea, they freely gather the appropriate people together to work on it. When, and if, they need management, they’ll bring us in. The impetus for a team is passion – someone who cares enough to go for it. No one in management or with a specific title needs to approve or sanction the effort. These various opportunities and ideas may already exist in a department or function or they may not. In essence, our team culture is ad hoc, complementing and at times changing, our existing structure. We stay out of the way as much as possible. Of course any major capital expenditures or corporate-level hiring need our approval, which is easier as we move to rolling quarterly budgets vs. fixed annual budgets. Otherwise, the teams are free to gather the resources they need without a formal process. They create their own ROI/Business Cases (with the support of local finance department help) and present it to us, if necessary. Now, along the way, we have made mistakes. A few years ago a self-managed team on a large machine was cheating on over-time so we had to give them a supervisor again. However, that’s been very rare. Most of our self-organized/managed teams have been very successful. For example, Jeff’s RII market-approach started from a self-organized and managed team of sales, marketing and design people in different plants and functions. As they succeeded, they told us in order to scale and capture value, new corporate and plant-level roles needed to be created. The team created the business case themselves, including the human and financial resources and re-allocations. Since this was corporate-wide, they presented the case to us and it was approved. This was one of the best decisions we made. RII remains a self-managed team that has been essential to our growth. (Deb thinks the RII team is one of our most fun to work with – a unique combination of intense debate, disagreement, honesty, trust, friendship, humor and insight.) As RII has grown, it does get a bit more oversight form leadership based on their budget for both expenses and sales growth. Here are some examples of a few self-organized and managed teams at the inter-plant, intra-plant and individual levels. As we continue to have success, we have more examples of our ‘autonomous’ teams. See how, when we stay of our people’s way, their passion to delight our customers and each other creates success. Don Thaemert, account manager for a major customer in the Lakeville, MN (LV) plant, knew we could be doing a lot more than we were for his customer. He invited 20 people (no management) from production and print manufacturing, design, and customer service together and challenged them to create something innovative (both in terms of cost and value) for the customer. In our “ask and they shall come” tradition, Don just asked them – he didn’t ask permission, didn’t check with everyone’s management, just asked and they came. No process, no forms, very ‘ad hoc’. While the team’s purpose was mostly within the scope of their day jobs, this effort clearly went above and beyond. One of the most promising innovations came from two different plants 300 miles apart who reported to different VPs who report to Mike: Don’s (LV) and Mike Beinemann’s (sales) Folding Carton (FC) plant in Neenah, WI. That didn’t matter. LV’s designers and FC’s pre-press operators experimented with various designs and finishes, including special 3D, animation and light effects. The team made all their own decisions through discussion and consensus and allocated the resources required for prototyping. Don and Mike B conducted a seminar for the customer and their ad agency on our capabilities. It met with great success. The solution required additional funding since it affected FC’s press time. The team created a simple business case and presented it to the FC plant General Manager via conference call (detailing the what, why, how, when including upsell, approximate costs and sales). The General Manager said yes, and that was that. It was off and running. Recognition was simple but powerful. Within MPC, the team was recognized in our monthly newsletter, in sales meetings and with praise and “pats on the back” which mean a lot in our culture. The customer recognized the team within their own company, holding them up as an example. Don now holds an annual meeting with the team, continuing to challenge the status quo on adding value to the customer. Don and Mike B. turned this process into a ‘template’ used corporate-wide to anticipate and solve our customers’ needs. Just this past month we had another typical example of teamwork. Our Iowa plant asked a few other plants (300 and 650 miles away) for help designing a customer solution. Two employees from the farthest plant drove our Mobile Design on Wheels lab (a design and prototyping ‘lab’ inside a semi-tractor trailer) out to Iowa, giving up two weekends with their families without complaint and without expecting extra compensation or reward (though they will get it in time off and gifts for themselves and their families). Designers came from two other plants just to help; one of them doesn’t even do any business with the Iowa plant or customers. People checked schedules with colleagues and management. They didn’t need to ask ‘permission’. Each plant paid for their people to go; they didn’t ask the Iowa team to pay everyone’s way. There was no boss asking for this – the idea, request, and execution was all done by and for themselves, simply because a plant needed help. In strategic planning, we knew project management was a gap. Mike asked a few people to look into how to fix it (the extent of his request), gave them free rein and said to come back when they had a solution. They organized a team from all the plants to understand and define the challenge and come up with solutions. No one was “freed up” to work on this, and though it related to his or her ‘day jobs’, it was a significant added task, which was eagerly taken. Anu Varma and Angie Shepard, original team members, remarked that the team’s passion was pretty typical of MPC’s teams, especially those led by the businesses, not management. The team developed a discovery process. They didn’t pick a leader but used a ‘divide and conquer’ approach to maximize productivity. Leveraging their type “A” strong personalities with lively debates, they reached decisions through discussion and consensus. The process was energizing. They realized culture was their biggest challenge. In searching for analogs, they used the success of our safety initiative as a model. The proposed solution asked for a full time corporate champion with each team member serving as a local plant champion. The presented proposal included a job description, list of required competencies and names for the full time role. We approved it right away and the team started conducting formal interviews. They put one of their Lean gurus, Aaron Pontow, in the full time position. The next challenge was making the project management process very easy to use. The manual process couldn’t scale, requiring a technology capital investment. The team did their own in-depth competitive and technology analysis, issued an RFI, vetted the finalists, chose a vendor and did the ROI case which they presented to us. We accepted it with one caveat; we wanted their 3yr plan reduced to 2! We trusted the team’s ROI case – which says a lot about the team and culture. Today, the team provides oversight. Everyone is at his or her real day job that includes championing the new project management program locally. The team has been publicly recognized in the newsletters, but the informal recognition and respect in the company and meant even more. A few years ago, Heidi Schultz, Senior HR/EHS (Employee Health & Safety) representative at the FC plant, noticed safety hazards going unreported and/or untracked. People really cared about safety but the system was hard to use. Heidi created an easy to use system for reporting, tracking and fixing safety hazards she called Safety Snags. As the plant-floor employee volunteer Safety Committee promoted its use, Safety Snags’ grew. When the number of snags grew significantly, Heidi asked one of the administrative assistants to track them. The answer was an unequivocal yes, without asking for compensation or changes to job descriptions. Employees were excited to see hazards fixed faster than before. At quarterly plant meetings, Heidi gave prizes to randomly selected people and those who reported the most snags. Safety Snags became a fun competition. Heidi didn’t need approval or allocation for the prizes or the process. Because of how Heidi packaged Safety Snags (training, promotional material, tools), it was easy for the other plants to adopt it. Word spread in the monthly conference calls organized by each plants’ EHS representatives. By 2011, Safety Snags was corporate-wide. In recognition for her efforts, Heidi received 2 prominent awards from both MPC and Menasha Corporation : The President’s Award to any individual or team “for extraordinary innovation and/or performance which significantly contributes to the Company’s Vision” including a financial award, public recognition in person and in MPC’s monthly newsletter; and the Living the Vision award selected from President’s Award winners with the Menasha Corporation Foundation donating $5000 to Heidi’s non-profit of choice. As we’ve said, very little of our self-organizing culture is prescribed, it just happens. People feel empowered to experiment and innovate. Perhaps this is because of our strong family culture. Donald “Tad” Shepard, Mike’s father-in-law and the great-grandson of Menasha’s founder Elisha Smith, said, “Arrogance, pomposity and self-importance don’t have a place here.” We hold ourselves accountable to our values and each other (see “Helpful Materials: Documents: Menasha Commitment Letter Final Draft.pdf”). We deliberately and carefully hire for culture and values (see “Helpful Materials: Documents: Core Values.pdf”). We look for team players willing to get their hands dirty no matter what level, a servant-leadership mentality, a “Yes, and” mindset, comfortable in ambiguity and the unknown, humble, confident (but not arrogant), unpretentious, and a strong value on community. While the strategic plan specifically focused on “fostering a culture that thrives on change, innovation and growth without compromising our core values”, the basics of that culture are ingrained. Everyone (almost) has a great attitude. When you walk through a plant people smile, say hi, laugh together and work together. Employees are hard pressed to remember a time they reached out to a colleague, peer, subordinate, or superior, who wouldn’t help. People just do whatever needs to be done to help a customer and each other. We (management) are rarely involved except for major capital expenses. Rarely have we turned down a capital investment with a compelling business case. The hierarchy is intentionally fairly flat, ranging from a span of 4 to 6 between Mike and the plant floor employee, depending on the plant. This may seem rather unusual to some. Autonomy and teamwork are not institutionalized; it’s in our DNA. Why? Well, we are not totally sure, but we think our people and sense of community hold the key. People: We have really terrific people. Relationships based on trust, common purpose and focus matter more than hierarchy. For the most part, our people enjoy what they do and who they work with, creating a virtuous cycle. There is an innate passion and excitement about doing the right thing – to do whatever it takes. It’s not for extrinsic benefits. Our salaries and benefits are in line with our competitions’. Unlike most competitors, we do give all our employees a meaningful share in our profits and invest in their training and development beyond industry benchmarks. That said, our people tend to be motivated more by intrinsic than extrinsic rewards, in line with Dan Pink’s views; it’s the handwritten thank you notes from Mike, newsletter articles, respect, pats on the back, praise and personal “thank you’s” that mean more. Even more are the praises, awards and recognitions by our customers. These energize us and drive us to further innovate and delight our customers. It’s this passion and energy that makes us all go above and beyond and is part of the reason our turnover rate is lower than the industry’s. Especially poignant was when one of our plants’ employees wanted to learn sign language since a recent machine operator hire was deaf. They felt it would foster more natural communication than writing, so we provided weekly on-site sign language classes. Community: Mike views himself as a steward of the company and its communities. Our success directly impacts our communities’ economic and social health. Many families and small businesses depend on MPC and our ecosystem. We take this very seriously. We run into each other outside of work all the time. We meet in the grocery aisle, the baseball or soccer field, the gas station, the parent/teacher conference, and the hardware store. In fact, many of us grew up together on the baseball field, in the band, and at school. We are from our communities. These bonds and relationships transcend walls and raise the stakes and sense of accountability. Is this why we are so involved in our communities? Well, all we know is that our core values are truly core. There are several ways we are involved, most of which are probably fairly typical. Our employees are involved in various community activities such as Big Brothers and Big Sisters, school boards, town counsels, clothing and food for local shelters and food pantries, soup kitchens, town cleanup/beautification and recycling. During the holidays, entire plants adopt families and provide complete Thanksgiving and Christmas dinners, food baskets, clothes, presents, provisions for heat, etc. One plant’s motto is “Never walk by a free sample”. They collect the sample-sized beauty and health supplies from hotels, salons, doctors’ offices etc. and donate them to local shelters. A growing area of involvement is in supporting diseases that are touching our families and friends – diabetes, cancer, etc. Additionally, since many of our employee families have or know of someone in Iraq and Afghanistan, we’ve enlisted the support of our vendors and customers in sending supply packages to our troops. It’s also important at a corporate-level to give back to our employees – to ‘walk the talk’. The Menasha Corporation Foundation provides tuition reimbursement to finish college, financial “matches” to non-profits in which employees and their families volunteer time and college scholarships for our employees’ children. The matches and scholarships are published in our monthly newsletters along with employees’ and their families’ other accomplishments: scholarships, awards for community and other service, academic awards, athletic accomplishments, awards by our children, races, fundraising walks and activities, etc. While Deb, being from NJ/NYC, has often wondered if this is a ‘Midwest’ thing, her favorite community involvement is a unique and fun one – The Muscatine Great River Days Annual cardboard boat race. 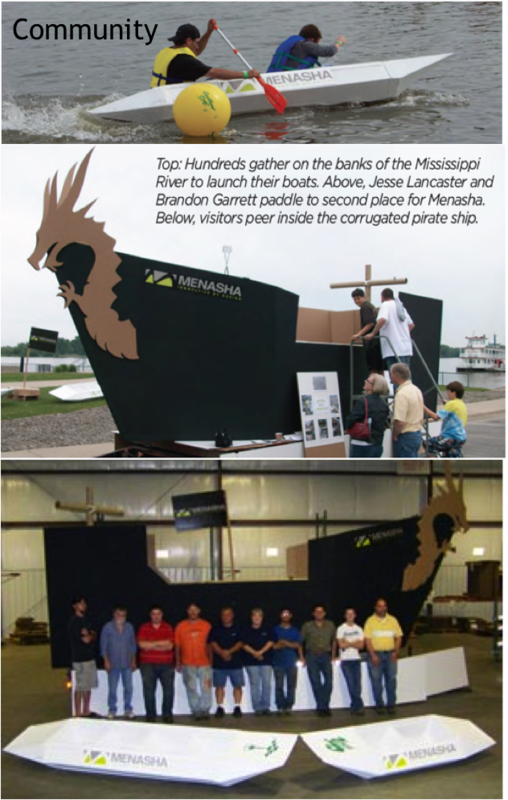 In 2011, a volunteer team from our Muscatine plant entered canoe-like boats and a 30’ long 11’ tall Pirate ship. They even used their Lean training to design and build the boats! The team met during lunches and after work to design and test prototypes, commenting that though it took them out of their comfort zone, they had a lot of fun. On it’s maiden voyage, it carried 4 employees for 10 minutes without leaking! (http://youtu.be/3FLnPxvhA-o). Timeframes & Perspective: Our Company’s heritage and legacy puts time in a unique perspective. While all of us, including our board and Family Council, have high performance expectations for MPC in terms of ‘outputs’ (revenue, profit, etc. ), we also have high expectations for sustaining meaningful, impactful outcomes. Our outputs are the means to provide the outcomes our customers, employees and communities’ value. All of us at MPC are here because, for the past 163 years, our leaders have worked to balance short-term performance AND long-term growth. This is not easy and it is vital. Managing that balance requires accepting the paradox of deliberate and flexible decision-making. One of the ways we’ve tried to achieve this balance is by adapting our ROI and ROA requirements to include “intangibles” such as sustainability and innovation…still a work in progress. It is both formidable and joyful. Our strategy arose because of who we are and what we want to be able to do for our customers, our people, our community and our shareholders. Executing that strategy has been critical to our cultural and financial success, which positively reinforce each other. But as rosy as this sounds, in 2005 when we started creating the new strategic direction and spoke about increasing autonomy, we had many challenges and many many skeptics, from the board to the plant floor. Challenge: 2003: Just prior to Mike becoming president, we had a formal ceremony to bury the old mission statement and announce a new one. Performance was deteriorating and the company was put up for sale about a year later. There was diminished trust with leadership. Employees didn’t have any sense of the future direction of the company, other than it was probably bad and that any commitments could be up in the air. ◦ Mike visited all the plants to share the commitment letter (see “Helpful Materials: Documents: Menasha Commitment Letter Final Draft.pdf”) and why and how the new strategic plan was created, conveying a sense of urgency and how employees were critical to success. HR implemented a tool aligning everyone’s goals from Mike down to the plant floor. It helped each of us understand our part in the plan – how we contribute and have impact. It provided transparency of the Why, What, How and interdependencies between our roles and responsibilities and it confirmed commitment to the plan. ◦ Mike demonstrated his commitment to the strategy through action. He 1) admitted vulnerability by openly saying “I don’t know” when he didn’t to any employee, asking for their input and ideas on how to discover the answer; 2) invested in employee training and education; 3) invested in equipment to make money not just cut costs (e.g., people) allowing employees to present their case (ROI) for new equipment. His willingness to spend money to make money increased employees’ passion to try new things. ◦ Frequent and transparent communications in various forms and methods, including recognition, awards, customer testimonials, product awards etc., stressed commitment. Even achievements of employee’s families’ were/are recognized, including scholarships from the Menasha Corporation Foundation. ◦ Improved recognition/rewards and salary increases: changed profit sharing to give a more meaningful (higher) amount to employees; hand written notes from Mike to employees for special occasions or events; expanded the President’s Award mentioned earlier and created the “Living the Vision” also mentioned earlier. Results: Within 18 months, almost every employee knew the strategic plan and why he or she mattered. Once employees realized we were committed, more self-organizing teams arose, employee retention increased, key customer wins increased, costs decreased, and profits increased. Employees saw that the direction was really working. Challenge: Plants were very entrepreneurial, empowered to do what was needed for their markets, but we lost cross-plant synergies (e.g., procurement). We had opportunities for national accounts but no holistic way to service them. This increased our costs and decreased our ability to win in the market. Any solution to gain synergies had to support autonomy and not seem like we were trying to gain control. Solution: We redesigned corporate to save money, gain efficiency and leverage without becoming bureaucratic by instilling more accountability at all levels using the process and tools from HR cited in #1 Solutions above. Additionally, we provided forums to share best practices across plants (e.g., designs, lean applications, pricing). These forums occur in person and on-line. They vary in size depending on the purpose. For instance, the RII team of about 20 people meets a couple times a year face to face and the rest of the time uses a combination of our on-line collaboration tools, conference calls, and email. The HR and EHS teams range from 8 to 12 people and have regular on-line meetings. Result: Each plant is still autonomous but collaboration between them has increased on their own, as you can see from above. The VP of Finance, Gail Constancio, is enabling “Centers of Excellence” across the plants to share learnings and expertise. For instance, one plant is great at costing so they help the other plants learn how to do it better; another is great at pricing so it teaches the other plants, etc. Each plant’s GM, colleagues and functional representatives identify the experts for each center. Collaboration has resulted in new and profitable product and service offerings that are helping our customers get product onto and off the shelf faster. The Safety Snags initiative is a great example of a best practice that that started out small at one plant and quickly grew company-wide by employees sharing stories instead of being mandated by management. Challenge: The basic challenge to cultural development stemmed from the above two challenges with the underlying issue of trust. Overcoming them simultaneously resulted in increased autonomy and self-organizing/managing teams faster than planned, which increased innovation. Solution: Our ongoing Safety initiative focused on employees’ well-being versus reducing worker’s compensation combined with our Lean initiative’s fledgling success provided the groundwork. The time, training and financial resources invested in these two initiatives demonstrated our commitment to employees on many levels. Because Safety and Lean had tangible results and we were walking the talk, the innovative culture initiative based on increased autonomy had credibility. We reinforced this with more training and freedom. Our people also realized that Lean tools could be applied to innovation, so they could use something they knew in a new way. In addition, RII’s success created an unstoppable energy and passion for innovation. At a fundamental level though, just sticking to the plan, not changing direction, was critical to trust. Result: While some plants were more autonomous and self-managing than others, which led to more innovation, today there is a lot more inter- and intra-plant innovation as autonomy has taken hold. Revenue and profits from new product and service offerings since 2005 have increased steadily and significantly year over year. Challenge: Because of our history and the industry, the Board didn’t think MPC was a good business to keep investing in, hence the decision to sell. Furthermore, because previous efforts to turn MPC around hadn’t worked, the Board’s confidence that this time we’d be successful was very low. Solution: Execution! The solution was very simple, but not very easy. By executing the plan and showing consistent success over time, the Board’s confidence in the business and in us grew – slowly. The more success we had, the more the Board supported seeing the plan through. We spent a lot of time making sure the Board understood why we were doing what we were doing and showing how the reasons for our successes tied back to the plan. Result: The Board’s confidence in our business and in us is very high. We delivered at or exceeded plan, even during the “Great Recession.” Our requests for large capital are always approved because we do our homework and we bring the board along at a pace they can absorb major capital expenditures. The biggest sign of confidence is their recent approval of a significant, unprecedented acquisition, soon to be announced. The benefits to MPC are tangible and intangible. MPC’s tangible results are continual, consistent increases since 2005 in market share, revenues, profits AND ROI. Before the recession, RONA (Return on Net Assets) increased consistently by 7% and even up to 17%, with higher RONA on the higher-valued (e.g., non-commodity) products and services. During the recession, sales increased by significant double-digits due to capitalizing on 2008's investments and facility alignments. Retail and CPG market sales even increased in the down market. Gross margins were the highest they'd been in 5 years because of win-win relationships with suppliers, price management, rapid utilization of new investments and inventory turns. EBIT even rose! We ended all years, including 2008, 2009, 2010 and 2011 with a strong cash position and exceptional current receivables. While the bigger integrated firms dismissed us, we became a formidable competitor. Instead of just taking market share, we created new share with new solutions in new markets (what some call "blue ocean"). 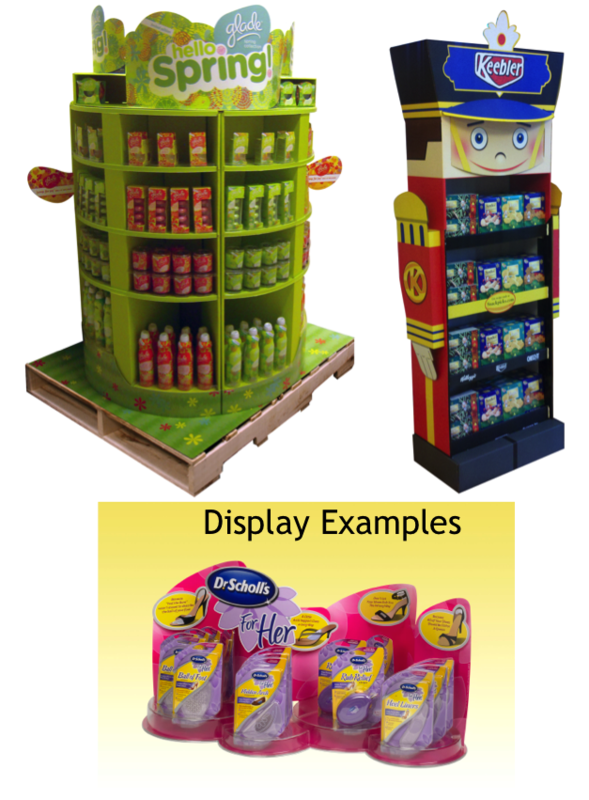 Many customers view us as a vital part of the merchandising process. Key retailers require CPGs to use our products and services in their stores and CPGs can measure how our products help both their top and bottom lines. As a family business for 163 years, we believe first and foremost that our people matter. The result? Trust, respect, insight, commitment, energy, fun, accountability, diversity, listeners, communicators, encouragers of cognitive dissonance, debate, paradoxical thinking. Our people know we genuinely care about them and their families. We give them the tools and the freedom to do their jobs. Fundamentally, we expect all of us to live the core values - these are not words or platitudes, they are real, and they make a tangible and intangible difference. Hire for culture and values: Skill matters, experience matters, but if the people you hire don’t fit ‘into’ your culture, don’t have a history of living your core values in their previous positions, then don’t hire them. And if people in your organization don’t adapt to the culture or live by the values, let them go. For us, this means hiring people who aren’t caught up in titles, hierarchy and who love collaborating with a passion for delighting the customer. Your culture is your most valuable asset – tangible or intangible. Involve employees in strategy & execution: Get their input and show them the link between what they shared and how it is part of the plan. Then, show them how what they do matters and has a direct impact on the plan. For us, given the history of strategic shifts, staying the course mattered a lot. Evidence like key customer acquisitions, cost savings, spending money in equipment to make money, regular updates on the plan, integrating strategic goals into everyone’s performance criteria from Mike on down all led to increased trust, credibility, faith which led to more self-organizing and managed teams, empowered freedom with outcomes like increased employee retention and more evidence of success! Align the budget with the strategy: The adage “Put your money where your mouth is” is so true. We created the strategy and then the budget to support it instead of creating the budget and then the strategy to rationalize it. Our people saw we were allocating money for their training, career development and even for equipment to make their jobs easier, more innovative and even more fun. We created a toolbox for sales to explain the new business model. We bought equipment that not just saved money in terms of efficiency but also enabled our people to create new capabilities, products, and designs. We told them to show us the ROI and we’d do it and we did. When our people saw that we really meant what we had said by putting real money on the table, we unleashed their passion and creativity. You know the real estate phrase “Location, Location, Location”? Apply that to business as “Communication, Communication, Communication.” When you think you’ve done enough, keep going. Be transparent: Communicate the good and the bad; show how it ties together, why and how it matters to everyone at every level. Look for Bright Spots: Emphasize and reinforce what is going well (Bright Spots) and minimize what isn’t going well. There will be some grey areas, but it’s okay to let the grey areas sit for a bit – sometimes they go away or get solved through other efforts. Use all the forms of communication available: Leverage technology and generational preferences. Communicate in person, live video, ‘taped’ video, webinars, conference calls, emails, collaboration spaces (real & virtual), on-line/off-line newsletters, etc. Be authentic, genuine, vulnerable and human: Admit when you’re wrong. Let your employees see you for who you really are – that you have flaws and make mistakes just like them. Then, people will believe in you and believe you. Be patient: Don’t try to change everything all at once. Unless your culture is horrible, all you probably need to do is some adjusting. Create a manageable set of steps and milestones to get you to your goal and don’t force it. Genuine trust and freedom cannot be coerced, they have to develop. Commitment needs words and action. Our letter of commitment was a necessary first step, but if not backed with action and consequences at all levels, it was vacuous. We said and showed our commitment to the plan (as described in Lessons 1 & 2). However, our plan had to be adaptable and flexible so we didn’t stay committed to a plan that led us off a cliff. Commit to the possible: Ensure that what you are committed to is not so cast in concrete that sticking to it can lead to demise rather than growth. It needs to be alive, adaptable and flexible, especially to survive in the 21st Century. Commitment isn’t optional: Require commitment from your team and your people in words and deeds and tie that to performance. If people can’t commit, they can’t be a part of the team, or perhaps the company. Don’t keep trying to get buy-in from key people forever. We believe if we can get 40% of our people engaged and committed, we’re doing well (the actual percent is much higher, fortunately). There will always be people who either don’t buy in at all or totally. That’s ok, as long as they aren’t actively working against you – in which case you need to let them go. We’ve found many dissenters either come around or leave on their own. Commitment is personal: MPC isn’t a case study, it’s a real live company that families depend on. We, as management, can’t view it as theory - we know these people in and out of work (community). Your people need to know and trust that you’ll be in the trenches with them. No task is too small or too big just because you’re ‘management’ or because it’s part of performance appraisal. It needs to be very personal and real. As we started in 2005, we recognized a critical risk was the status quo. We had to change the game. Succumbing to the traditional view was the path to decline, not growth. Few companies recognize the status quo as the real risk. As we became successful, we knew that one of the greatest inhibitors to success and innovation is success! We were concerned our success from 2005 to 2008 would cause complacency. We continually challenged our employees and ourselves by sharing what was happening in the market which kept an 'edge' and avoided complacency. It also helped that challenging the status quo is one of Deb’s favorite things to do. Her constant questioning and asking “Why” made us challenge our assumptions and get to root issues. Question, Question, Question: The cliché of asking “Why” five times is based on reality. Question your assumptions, theories, hypotheses and even your experiments to validate them. Have someone from the outside help you because you’re too close to even realize some of your assumptions. Get out: Get out of the office, the plant, the town. See and really listen to customers – understand their business as well or better than they do. Don’t ask about what you do for them; ask about their whole business. Learn from other industries – related or not. Start playing with different business models. Go to plays, art shows, sporting events (yes, we are major Packer fans in our Wisconsin operations), concerts, volunteer etc. Get out of your comfort zone, your routine and learn from what you see. Go to conferences not in your industry or even business. Travel. Business is serious business – but serious and somber are two different things. Having fun is very important. It’s a sign of authenticity and pride. When we’re wrong, we even joke about it. Celebrate together. All work and no play make us very boring and uncreative – which is counterproductive to growth. Changing a culture and executing strategy are tough stuff – make it enjoyable, not painful. For us, this is pretty easy since we all like each other. Having fun together also helps us like each other. It builds community and fellowship. Plan fun things: Some fun things happen spontaneously (like Frisbee games at lunch) but deliberately plan for fun. When the weather is nice we have picnics outside (many plants have patios and grills), we have regular tailgates at Packer’s games (we are fanatical), we use community activities for fun as well (e.g., the Muscatine cardboard boat races). Be involved in the fun yourself – don’t leave it to ‘others’ – get dirty, wet, fall, lose – be genuine. Be fun: Opinions may vary, but for the most part, we are fun people to be around. Deb repeatedly comments on the smiles and laughter at HQ, the plants, and especially with teams. Because of our (warped?) senses of humour, we really do have fun in the plain old day to day. We trust each other enough to joke and tease each other and ourselves. This lightens the mood and frees up people in ways you can’t orchestrate or plan. The real credit goes to our employees whose curiosity, enthusiasm and dedication have created compelling customer solutions and a wonderful culture. Credit also goes to the rest of our leadership team: Jerry Hessel who, today, focuses on future opportunities; Mike Riegsecker & Denny Lee who oversee the various businesses; Gail Constancio, Finance VP, who isn't afraid of innovation; Rick Calhoon, Procurement, who knows how to manage and unleash resources: Don Jansen, HR, who positions HR as a strategic player; Dennis Bonn, Marketing, who has taken MPC's image to a new level; and Bill Kime, Lean, who has showed MPC how lean & innovation fit hand-in-hand. Deb’s Note: Though he will deny it, Mike is one of the best leaders, epitomizing servant leadership, I've known or had the honor to work with. His passion for his people is contagious and his integrity and commitment to do what is right shows through MPC's success at many levels. I am honored and blessed to have been a small part of this team's success, in the past, the present and the future. I liked especially, that you pointed out "the biggest inhibitor to success (innovation) is success". Too often people and whole organizations become reluctant when they are in comfortable position. The just neglect the non-linear nature of their environment. It is amazing to see how even an established company at the age of 160 years can innovate and evolve to meet the needs of today's employee culture. I think one of the strongest lessons learned in your story was #2 which states the real risk is the status quo. It seems many companies do not get that message and that is why they fizzle out in the long run. This story demonstrated how a company evolving and developing a strategy to meet today's employee needs can have a significant impact. Thanks for sharing! It is amazing how we get lulled by the status quo - kind of a boiled frog syndrome. And we forget that what is today's status quo was once disruptive. But it's known, it's safe, and no one ever got fired for the 'status quo' (so far). Thank you for sharing your story. The subject line drew me to this story as I am interested in seeing how a mature companies implement successful innovation and change. You did not disappoint! It’s amazing how developing a clear strategy with built in transparency can have such an impact of employee culture within the company. Your Lesson 3, “the biggest inhibitor to success (and innovation) is success” really resignated with me. I think this is the primary reason why most mature companies stick to their old ways. Relying on historical market share and brand will not last forever! MPC was able to quickly recognize that internal change was needed to stay in business in this changing environment but will it be too late for some others. I hope other mature companies learn from your success. Congrats to the MPC team! Thank you! Unfortunately, MPC is pretty rare, at least in my experience. I had another client present at an innovation summit this week about the difference between invention and innovation - and their problem again is success - they have been doing so well that why should they change? Blinders! Deb, you tell the stirring turnaround story of a company still working from the model of an earlier age. Due to your consultations, the leadership team found the wherewithal to begin the process of moving from an either/or path to an “AND” path, which focused on employee-advantage AND customer-advantage. Organizational momentum grew as the leadership team began to value people throughout MPC. This shift started when employee input was included along with that of supervisors, and all aspects of the leadership team. You describe the new President making himself vulnerable to employees by sharing MPC’s new vision and asking each person to help hold him accountable to it. Through this strategy, the President developed a new kind of relationship with employees. It was interesting to note that even janitors knew the three parts of the strategic plan. When people feel valued it makes a real difference to the overall relationships and willingness to buy in and take part. I’m curious as to the diversity involved in this workforce overall. Would you be willing to tell us a little more about that and whether there were changes in this during the time you worked there? Hiring designers on board brought a new form of diversity needed to help with prototype initiatives and experiments. Deb, you model collaboration in everything you do and it is another right brain quality needed more in today’s workforce. From what I read here, you were able to help the President and team to practice this, too. I appreciate your answer. It is always easy to help those that want to learn and enjoy making a positive different. I've been honored to work with MPC, and have learned a lot from them...and had a lot of fun! What a wonderful story, Deb, of skill and of humanity and of innovative leadership. Yes, I agree this turnaround showed that it really was, "all about the people," and you modeled here to show how "leadership got out of the way, stepping in to help eliminate or reduce challenges and make opportunities available.." Thanks for sharing the inspiration! I would like to hear a bit more about the years 2005 to 2008 - when they feared complacency, and to counter that they challenged themselves to avoid that problem. Would you say that is one of the stopgaps to innovative progress in organizations today? If so, how can their approach impact current complacency with possibilities? thank you! in fact i'm with them now. This afternoon, we actually looked at the original 2005 plan's projections for 2010 which, in 2005, we thought were a HUGE! stretch and they've all been surpassed! The concern about complacency setting in started around late 2007 and remains a healthy concern today. They've avoided the trap for a few reasons - obviously the economy in the last 2yrs has helped keep them on their toes, MPCs customers are under continuous pressure to increase sales and keep costs down which means MPC is always looking for innovative solutions to help their customers, they've created a culture that likes innovating and thinking out of the box (sorry for the pun), and leadership communicates the need to continually innovate to stay at the top of their game. I think being 'lulled' into complacency is a big problem for successful companies today. In fact, I have a few clients right now (public companies) having very profitable years (2009, 2010) and lots of cash - it's grindinglonger-term innovation to a halt! They either want to save the cash 'in case' and/or feel that something must be working - and if it ain't broke, don't fix it! Some of this success is due to the industry they are in, to the solutions they've brought to market (which means they were in the innovation pipeline for 18-36 months and are now bearing fruit), and to great cost and price management. However, their innovation pipelines are weak - nothing beyond incremental within the next 2 yrs and not much at all past that. This would be a great time to reinvest some of that cash, and in many cases it's not a lot, into the innovation pipeline, but it's not happening.